Equip Disciples engages in a variety of green stewardship ministries in conjunction with its training and discipleship. An integral component of Equip Disciples' theological training for indigenous church leaders in Costa Rica and in East and Central Africa is the proper stewardship of God's resources. These regions of the world are rich in resources, yet the people are relatively poor. Careful and respectful use of the available resources can lead to vast improvements in society and individual lives, while guarding against misuse and squandering of God's good gifts. 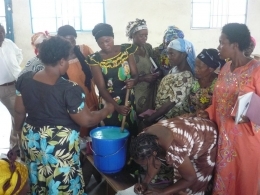 Using a soap-making recipe from Kenya, widows in Rwanda have formed a business to make and sell the liquid soap to local hotels and other buyers. This sustainable business provides a new source of income to help support their families. The ladies distribute the soap in reused water bottles, and ask the hotels to save the empty bottles to be refilled again. Ex-child soldiers in DR Congo produce exquisitely detailed artwork in earth tones from local materials. These cards are then sold in the US, and the proceeds help support the youth. Using the method developed by Water for All, Equip Disciples is actively working with local churches and pastors in Kenya to develop a water drilling and church planting ministry. Several wells have been drilled so far, with more in process. The drilling method is requires great manual effort, but is low cost and aims to be sustainable even within the poorest economies. Portable, easy and economical to build solar ovens have been used within refugee camps in parts of Africa. One organization, Solar Cookers International, has seen over 500,000 of their simple cookit ovens put to use. Equip Disciples has taken this design to DR Congo and taught ex-child soldiers there how to build this oven. Equip Disciples has provided solar-powered MegaVoice Bible players among the Cabecar people in Costa Rica and also among a people group in West Africa. This is one of the latest green ministry of Equip Disciples, aimed at providing education and insight into good stewardship of God's resources both in the US and around the world.